So last week we looked at what you need to take on an active holiday, this week we are going to delve more into the details and look at some good quality technical clothing that won’t cost the earth. While you don’t need to spend a lot if you are not regularly heading out into extreme conditions, you do tend to get what you pay for in terms of breathability, durability and wearability (how likely you are to use the item day to day, reducing cost-per-wear). Here are 5 essentials for a day-trip or active holiday, all brand items are available in both men’s and women’s sizes. As anyone who has been caught in a flash downpour during a hike will attest, this is the most important item of clothing to pack on an outdoor holiday. It is worth spending a little more on this particular item to make sure you have one that fits well, packs light and is breathable so you don’t end up overheating in the rain (not a pleasant sensation). Look for taped seams to make sure the water doesn’t seep in and underarm vents for ventilation. If you get one that looks good (not too ‘plasticky’ like that kagool you took with you on that school camping trip – we all had one!) then you’ll be much more likely to use it at home and get more use out of it, just make sure that you can fit a midlayer like a fleece under it for added warmth if necessary. Cotopaxi Tikal Shell jacket from € 150 – looks good (comes in lots of bright colours), feels good, lightweight, underarm vents rather than zips so more comfortable. A good breathable top is essential when on an active holiday. Choose one that wicks away moisture and keeps you cool, as well as drying quickly if you need to handwash it to reuse it the next day. Patagonia nine trails t-shirts from € 35 are available for both men and women and look and feel like cotton even though they are made from sustainably produced polyester spun jersey. Comes with Polygiene anti-microbial odour control treatment. A midlayer is a good thing to have if the weather takes a turn while out on a hike. Again, breathability is key, you need something that keeps you warm but doesn’t let you overheat. Ideally get something with a full zip at the front so you can cool down more easily without having to take it off. North Face 100 Glacier jacket from € 45. The classic North Face fleece is an affordable, durable item that you can throw in your backpack. Warm and lightweight it ticks all the boxes. We could write another post just on suitable outdoor shoes alone, and maybe we will! Good comfortable footwear is essential when on an active holiday. 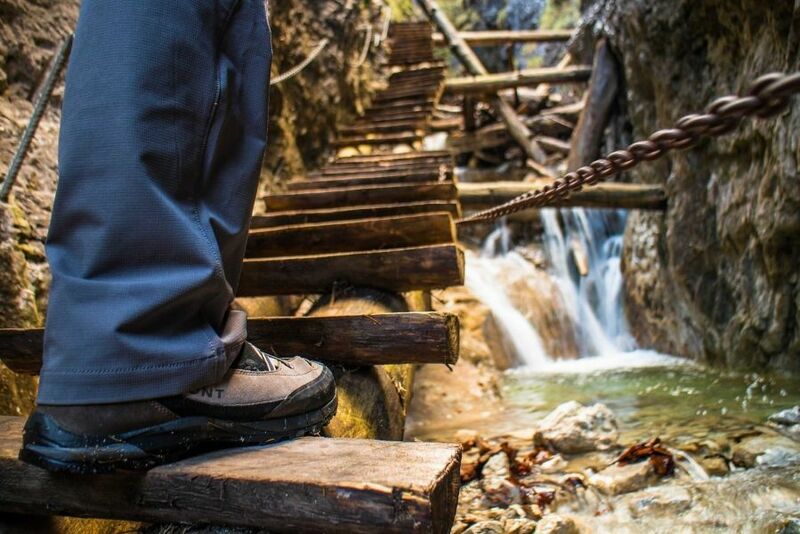 Depending on how long you’ll be spending on your feet and the type of terrain you’ll be encountering, you may not want to lug heavy duty hiking boots on holiday with you. Consider a hiking shoe, lighter and more versatile than a boot, but more stability and better suited to uneven ground than a trainer. Make sure you try them on at the end of the day or when your feet are more swollen after having been on them for a few hours, this will help you to find the right fit for you. Also try them on with the right socks and any arch supports you may use. Don’t use them for the first time on holiday! Break them in first, even if they are not boots they still need a bit of softening before you can comfortably wear them all day. Merrel Moab FST Low Gore-Tex. Water resistant, breathable, Vibram sole for traction on wet and dry surfaces so great for hiking, canyoning and other activities where a trainer will not offer enough grip and support. Also comes in a boot. A good backpack makes a difference, don’t just grab the first one you find. Make sure that it is a comfortable fit for your frame, ideally it should have an external mesh cage on the back, so you don’t get too sweaty carrying it all day. Exterior pockets for water bottles and/or a camel back pocket are handy as is a waist belt so your shoulders don’t have to take all the weight. La Sportiva A.t 30 backpack from € 80 with adjustable shoulder straps, 3 exterior pockets, external cage for optimal ventilation, camelbak pocket and fabric rain cover. Holds up to 30 litres and is ideal for hiking and mountain biking. We have 8 Sportiva backpacks to give away, just sign up to our newsletter to be entered into a prize draw. Offer valid until 30th July.